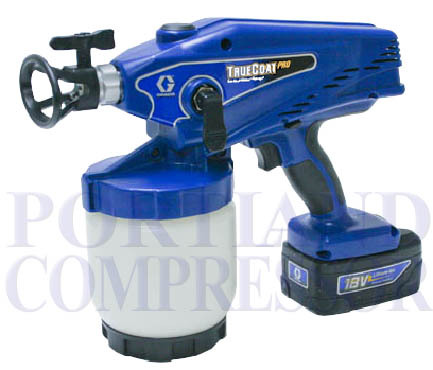 Expand your abilities with these Genuine Graco TrueCoat Accessories. Replacement Liners and material cups for the Graco TrueCoat Sprayers. With fixed suction tube. Created specifically for the TrueCoat Pro cordless airless paint sprayer. For larger applications and less cup fills; includes a cover for storage or use to shake cup for fast cleanup without a cup liner. Quick and easy twist-on cup assembly. Fits either 32 oz or 48 oz cups; plastic, disposable cup liners makes clean-up fast and easy. Available in narrow or wide fan sizes to spray thin to heavy, unthinned material. XWD515 TrueCoat Pro tips are a uniquely designed tip and guard combination that is XWD517 optimized for use with ProSpray Technology. Allows you to angle the pole 180° to spray ceilings, walls, and floors with a consistent and even floor pattern. These are for use with the True Coat Pro paint sprayer only. Add another battery to spray larger than 2 gallon [7.57 L] jobs. One fully charged battery is able to spray 1 gallon [3.78 L] for continuous spraying. Charge time for 80% performance is 45 minutes. Add a charger to reduce down time by charging two batteries at once. Light indicator monitors and displays charging progress. for hands-free movement on the job. with Pump Armor and leave it in until you use it again. Tip Filters Threads directly into the guard and filters paint for less tip plugs.